This survey was created by a bunch of folks on the Post Punk Kitchen forums. What's your favorite spice or spice blend? You have $20 to spend on fresh groceries and produce for the whole week (with a fairly well stocked pantry of dry goods, legumes, grains, and spices). what do you buy? Tempeh, avocado, cashews, apples. That’s basically what I buy every week with that amount. What's your favorite way to make tofu? If you could make anyone vegan, who would it be? 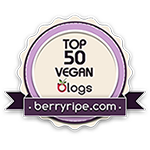 If you could only read one other vegan blog, what would it be? Let me get back to you on that one...there are a LOT of great ones, so it'd be hard to choose just one. Were you always interested in cooking, or did veganism change the way you saw and interacted with food? I’ve always been an avid and skilled cook. Veganism presented me with a challenge; omitting everything that I was used to using and prepare delicious foods anyway. Whew! That’s a pretty steep [but fun] order. Excluding analogues, what new things have you tried that you probably wouldn't have as an omnivore? Oh man, sooo many things...hummus, quinoa, tempeh, coconut milk, amino acids, the list goes on and on and on. What is the one vegan staple that everyone seems to love, but you can't get behind? Seitan. Of course, that’s because I’m gluten-intolerant, but the one time I made it from scratch, I had a really hard time eating it all before I just wound up throwing most of it away. What was your first "wow, I'm such a stereotypical vegan" moment? What would you like to veganize, but haven't yet? At this point, I've veganized most things I'm interested in. My food processor! What did I do without it? And my Kitchenaid stand mixer! And my new electric skillet! And my nut grinder! And my Pampered Chef spatulas! Basically, everything in my kitchen. Ohhhh, you don’t even want to hear about my gluten-free/vegan mistakes. I’ve made them at almost every turn. If anyone tells you it’s EASY to be gf/v, you have my absolute permission to roll your eyes and walk away. As much as I hate to admit it, wheat has been used for years because it’s just that easy. Grrr. Vegan with a Vengeance and I Can’t Believe It’s Vegan; both fantastic, both integral in my vegan journey. What question about being vegan do you HATE answering? “You must eat a lot of vegetables, huh?” Nope, I don’t. I don’t eat anything BUT Sweet and Sara vegan marshmallows. Happy now? If you could tell the world one thing about vegans, what would it be? We are not all Vegan Nazis. I will not gag or scream if I see you eating meat or dairy, just as I will not cough repeatedly if you smoke next to me (although, if I do, it’s completely involuntary, I promise!). Just please be nice to me and accept my diet, as I accept yours. Romanesco broccoli. Sooo cool looking; I felt like I was eating an underwater universe. What is a family recipe you have veganized? Gluten-free/vegan cabbage rolls and pierogi. Seriously delicious; even my mother and Polish father liked them! I was scooping up vanilla frosting with tortilla chips the other night. It was really tasty! Is there something you wish you could veganize, but can't/couldn't? Well, I’d rather have a healthier version of vegan cream cheese than the options that are out there. What’s one “vegan myth” you’d like to squash? Stop asking me where I get my %&($ing protein! I eat brown rice, quinoa, beans, etc., so leave me alone.